﻿ Stair Nosing | Scotia Stairs Ltd.
At Scotia Stairs Ltd., we stock a full product line of hardwood stair nosing to meet your job site needs. 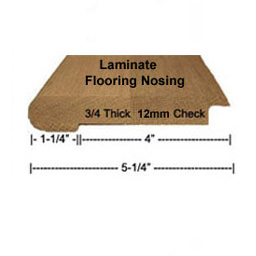 Our in-stock stair nosing is perfect for all three floor types: hardwood flooring, ceramic tile flooring, and laminate flooring ( which is made custom to meet the sizing of your laminate flooring ). Our extensive network of materials, allows us to access many custom stair nosings. As well, we can manufacture oversized hardwood stair nosing in a wider size to allow for the easy installation of the 6-1/2 inch bases on our hardwood box newels. Make use of our custom millwork facility. As a result, we offer special order exotic wood types: beech, jatoba, walnut, white oak, hickory, etc ( note: custom hardwood nosings may only be available on a volume basis or within a staircase package sale ). we can not make a hardwood stair nosing that is over 12 feet long.